It is sometimes challenging to stop the endless journey that leads to cultivating a better feeling physically, energetically, and eventually spiritually. 1. Let’s think of the asana (pose) downward facing dog. Imagine "performing" this amazing asana. Lift your thighs up and press your heels to the floor at the same time. Press your index finger firmly to the ground to create an inner spiral in the forearm. Rotate outward from the outer end of the shoulders as if you want to get the bottom tips of the shoulder blades toward the chest. This outward rotation opens your armpits and pushes your shoulder blades down and forward. If you tend to hyperextend your arms, slightly bend the elbows, keeping the inner spiral from the push of the index finger. 2. Now, here are some adjustments to enjoy the hero pose, virrasana. Sit on a block with your knees bent and your ankles near the buttocks. The three golden actions are: flex your toes just enough to activate the lower leg; send your inner ankles to the wall behind you to align the middle of your heel with your second toe; and then bring your outer ankles toward each other. Doug Keller says: "shins in, thighs out." Remembering this quote will work amazingly in all standing poses, combined with balancing equally on the four corners of each foot; this posture creates space in the hips and allows a more healthy, accurate movement. 3. The “Seven Loops of Freedom. Inspired from the Anusara yoga method and originated from the living legend Iyengar. For this next practice, think of your body as energy. Stand in tadasana with feet hip distance apart, shoulders relaxed, and head up. The Bottom Loop: heel toward the ground, rooting while the top of the feet lift and stretch toward the ankles. The Lower Leg Loop: the calves go up the back of the knee, and the front of the lower legs goes down. slightly bend your knees if you need to, it’s ok. The Upper Leg Loop: front upper leg goes all the way up to the hips while the back of the upper legs (the hamstrings) flow down. The Pelvic Loop: (great for the lower back) buttocks down, sitting bones towards the heels, lower abdomen goes in and up. feel the energy and try not to lose the integrity of the lower parts of your body you started working with. The Manipura Chakra or Lower Ribs Loop: below your sternum, relax your lower ribs down and maybe even slightly in, relaxing the diaphragm. the back body (in the lower/middle back region) goes up. The Shoulder Blade/Chest Loop: (this posture will always make you happy when practicing) shoulder blades down and away from the ears while the chest and the ribs go up. The Head Loop: the back of the head goes up; the front of the head goes down. keep your throat long and up and your chin parallel to the floor (but slightly back); this secret is the key for correct posture. Practice these actions in whatever way is comfortable to you. I’ve listed a summary of how I approach the loops. I am sure an Anusara and Iyengar yoga teachers would have many more things to add. When working on alignment, always use props, which—in this case—would be a block placed vertically between the shins. On both poses, I would also suggest you send your heels not only to the sky, but to the moon. Stretch your legs and body upwards with your heels, and then press hard with all fingers on the ground, never allowing the weight to move to the wrists. 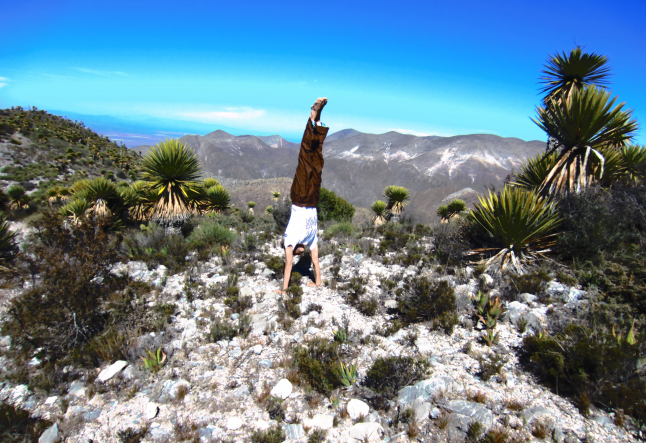 In the handstand, meditate on one point! In the forearm stand, use a belt above your elbows; eventually, you must bring your elbows together as strong as you can with the use of the shoulder stabilizer muscles, so that the skin in the elbows is not stretched towards each other. Your weight must come to the middle of the elbows. And, of course, for both balancing postures, place your elbows below the shoulders and your palms in line with the elbows. I hope you all find the universal truth in these simple alignment cues.